On a recent visit to Belfast, Patrick, Smith and I took a stroll from our hotel, the Europa, towards the Queen’s University Quarter. Our original plan and destination was the Botanic Gardens and the Ulster Museum but as the clock ticked towards Smith’s lunchtime we decided we’d find a place to eat first, and Molly’s Yard was the answer. One place I wasn’t familiar with was the restaurant Molly’s Yard but it caught my attention immediately. It stood out for me with its large black wooden archway and small open door. There was something interesting about the short open-air corridor that led from it that made me want to explore. Not only were we greeted by a small and pretty courtyard that would have been bliss had the rain clouds kept at bay, but also by a very friendly hostess who made us feel welcome as soon as we met. Under her guidance but more so the weather’s, we decided to dine indoors. Pushing through the door of the restaurant that is adorned with Michelin Guide stickers (I have a nose for sniffing good food out) we found ourselves in a converted Victorian Stables. The decor couldn’t have suited it more, and although serving Irish Cuisine there was something, I feel, quite French about it. We chose a table by the window as it was quite warm, and I happily perched myself on the window seat, soft with cushions. A high chair was provided for Smith, and we had ample room for his pram near the door as it wasn’t peek dining time. 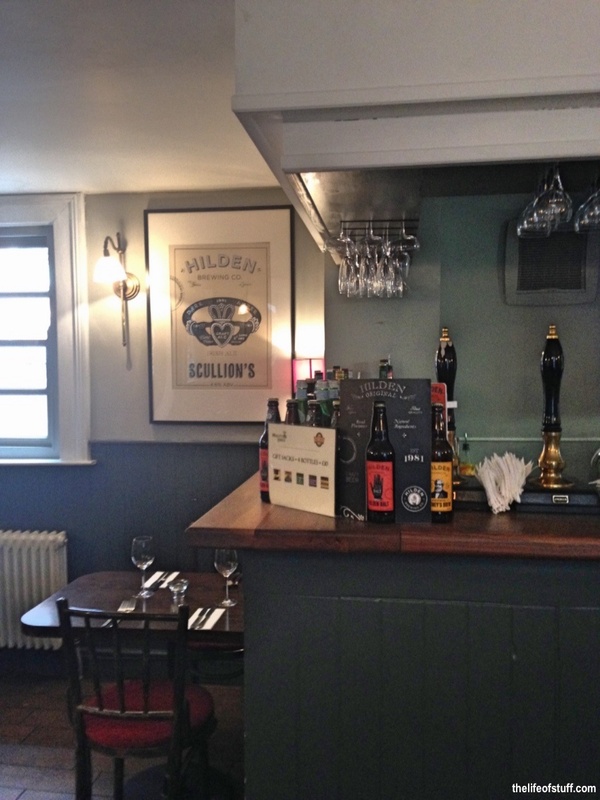 There’s no getting away from the fact that Molly’s Yard is the brain child of the Hilden Brewing Company. Along with their craft beer on draft, and by the bottle, there are tasteful and retro looking posters and framed prints hung on the restaurant walls that cleverly drive the brand home. 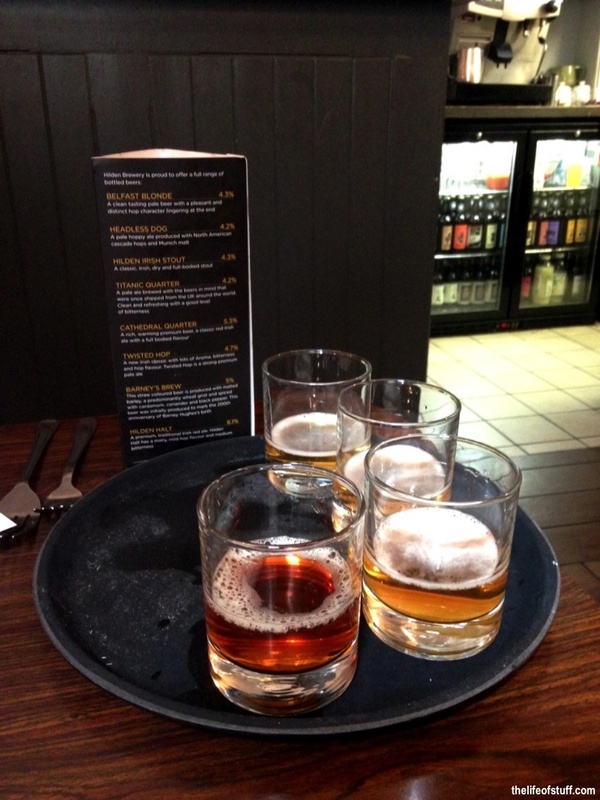 To help make our minds up about our choice of drink we were offered a tasting of four Hilden Beers, ranging in taste and strength from the familiar clean tasting ‘Belfast Blonde’ at 4.3% to the malty ‘Hilden Halt’ at 6.1%. 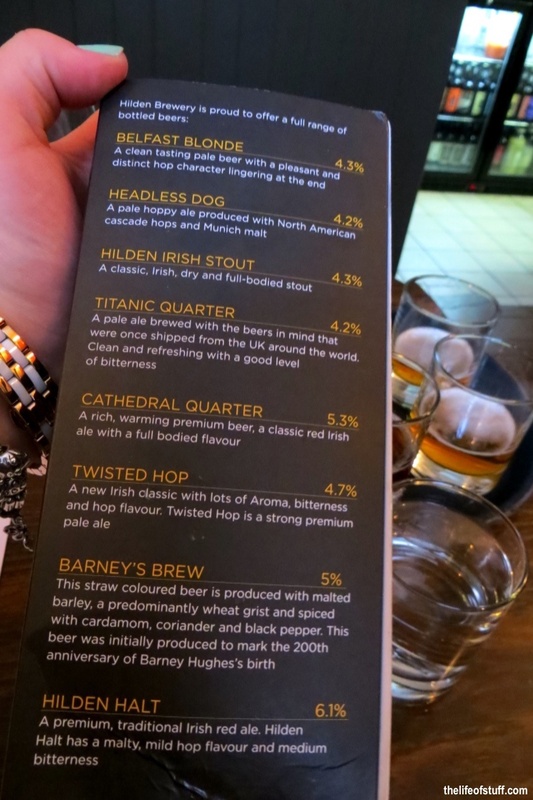 Patrick decided on the ‘Twisted Hop’ a premium pale ale with a happy medium of 4.7%. 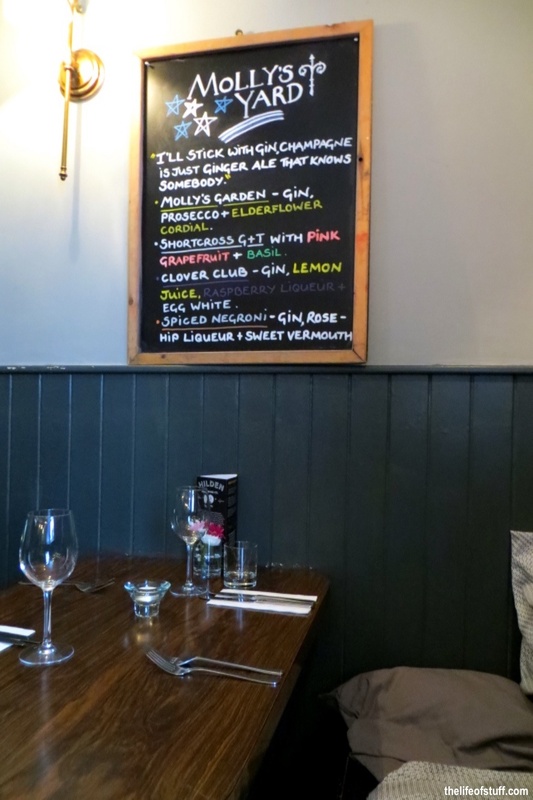 I on the other hand got a chance to taste rose-hip liqueur, delicious but opted for a Molly’s Garden Gin – Gin, Prosecco and Elderflower Cordial, refreshing. It was time to dine, and we chose from the £5 | £10 | £5 menu, which is £5 for a starter, £10 for a mains and £5 for a dessert. Clever and very affordable for quality dining. Although tempted by the Starters Menu that offered the likes of Sea Food Chowder with Hilden Stout Wheaten Bread and Duck Rillettes with Rhubarb Relish and Watercress Salad … and by the Dessert Menu that offered the likes of Abernethy All Butter Artisan Fudge and Warm Belgian Chocolate Brownie with Tickety Moo Wild Berry Ice-Cream and Wild Berry Coulis … (my mouth is drooling a little as I type this) … we decided, as time was not on our side, that a main meal each would suffice and that we’ll return to tickle our taste buds with the aforementioned offerings another time. For our main meals, Patrick chose the Goat Herder’s Pie with Gratinated Potato Top and I chose the Beef Flank with Pea & Scallion Champ and Sticky Jus. Patrick’s Goat Herder’s Pie was definitely fit to feed a hard-working Goat Herder, it was a hefty sized serving dish that oozed all the goodness of the pie and was generously topped with creamy potato mash. The meat was juicy and tender and was packed full of great flavours, excellent value at £10. My Beef Flank and Champ, did not disappoint. Like the meat in Patrick’s dish, my beef flank was perfectly seasoned, I didn’t need to add any, and cooked, fall off the bone cooked. The champ was the soft consistency I love and although flavoured with pea and chives, these thankfully didn’t take over but just added the right amount of colouring and taste. The Sticky Jus, added the juice to the dish and my plate was cleared in no time. 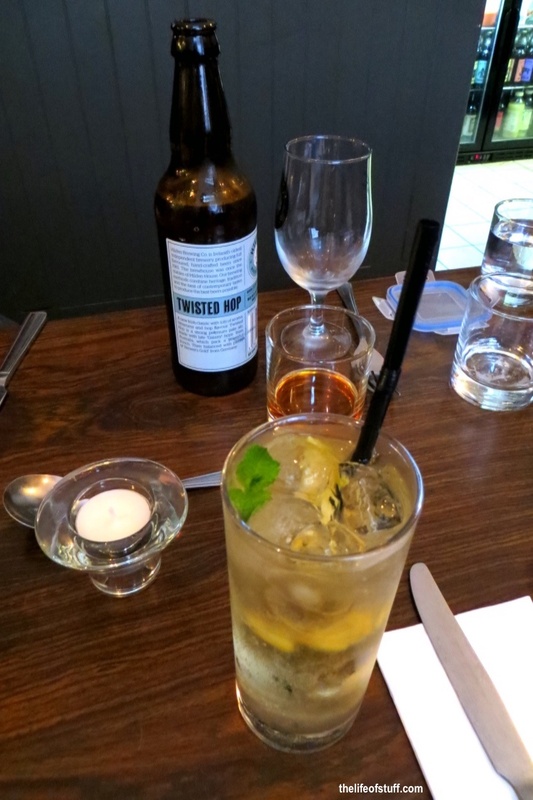 Molly’s Yard offered us a personal, warm and friendly service, a generous selection of Irish drinks from High Cross Gin to their own Hilden Craft Beers and a very happy dining experience, one I happily recommend. We look forward to returning.